"Blessed are the pure in heart: for they shall see God" (Matthew 5:8). Oxidized "True Love Waits" Purity Ring crafted in .925 sterling silver. God says that we must be pure in heart, in body, and in mind. Make a commitment to the Lord Jesus Christ to stay pure and chaste until He blesses you with your husband. Remember, there is forgiveness in Christ. Aside from salvation, the choice that you make for marriage is among the most important. Take your vows seriously. And may Jesus Christ, our Lord, give you the strength to follow His will all the days of your life. 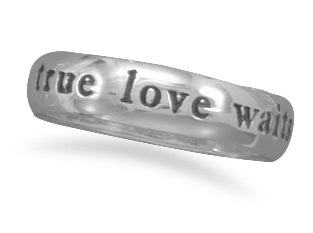 Our "True Love Waits" Ring is available in whole sizes 5-9. Every ring from Apples of Gold Jewelry comes with free shipping and a 45-day return policy, no questions asked. Apples of Gold is a Christian-owned company and we strive to put the Lord Jesus Christ first in all that we do. Be sure to check out our entire collection of purity rings. We guarantee our Oxidized True Love Waits Purity Ring in Sterling Silver to be high quality, authentic jewelry, as described above.